In keeping with this column’s early season capacity constraints, here’s ten significant numbers that help explain the madness of the first three weeks of this year’s AFL season. The top eight is starting to look a little more logical with 108 quarters of football in the books, but there is still some stuff that makes limited sense against pre-season expectations. What to do when pressed for time? Boil down a column to ten interesting, unusual or suspect numbers that help explain what has happened in the first three rounds of the AFL season, and what might be coming next. This is how often the Melbourne Football Club is putting the ball over the goal line per inside 50 (30 per cent). The competition average through three rounds is 42 per cent. 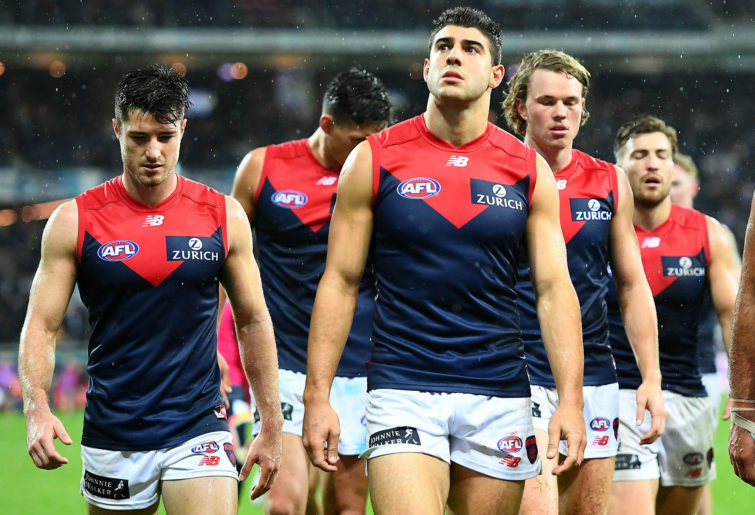 At 30 per cent, the Dees’ rate is the lowest conversion rate in the league. Last year, Melbourne was scoring on 46 per cent of its inside 50s, ranked fourth in the league. Last year, the lowest rate of score per inside 50 was recorded by Gold Coast. Gold Coast scored on 39 per cent of its inside 50s. While plenty is wrong at Melbourne, this is a critical one. Another one is below. This is how often Melbourne is conceding a score each time their opponent enters Melbourne’s defensive 50. This, too, is the worst rate in the league. In short, the Demons can’t score when they get the ball at their end of the ground, and they can’t stop their opponents scoring when the ball is at the other end of the ground. This is the number of clearances Patrick Cripps is winning for the Blues. In second place at Carlton are three gamer Sam Walsh and beanpole Zac Fisher, on 4.7 per game each. Carlton has rapidly moved down to 18th in most projection systems, which may be a product of Gold Coast’s start more than Carlton’s play itself – which hasn’t been too bad all things considered. However, it’s clear Carlton is in a heavy development phase. Cripps is a lone ranger. And what’s more, noting it is still early, he’s on track to break 200 clearances in the home and away season in a canter. If we extrapolate his 11 clearances per game out over a full 22 game season, Carlton’s Hercules will reach 242. Even if he slows down a little, Cripps’ start means he only needs to average 8.8 clearances per game from this point to break the double ton, which is an ordinary season for him. This is Geelong’s average adjusted contested possession differential per game through three rounds. It’s a figure which is a good way to proxy measure some of the super secret statistics captured by Champion Data – namely loose ball gets, hard ball gets, and contested knock ons – and it is also a decent predictor of the strength of teams. The Cats have been slaughtering their opponents when the ball hits the deck, a stark turnaround from last year when they were middle of the road (+4.5 per game). 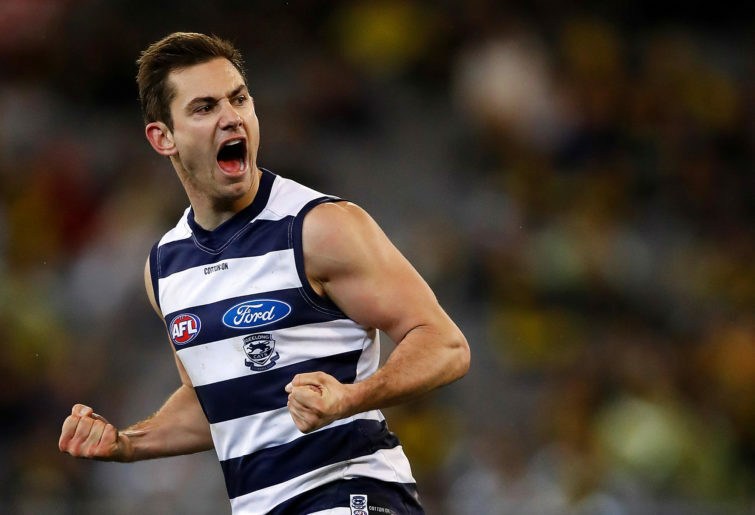 Similarly, Geelong’s tackle rate (tackles per 50 minutes of opposition possession) has gone through the roof, reaching 74.1 in the first three rounds of 2019 (with a differential of +10.9), compared to 68.5 (+0.3) last year. That’s the number of points scored across the first three rounds of the 2019 season, which is 412 fewer than the first three rounds of the 2018 season. And that, folks, is despite Round 1 last year having one game (Gold Coast vs North Melbourne in Cairns) being played in a lake, where there has barely been a bit of bad weather to open this year. It’s far too early to call the AFL’s rule change experiments a failure. However, this column has been privy to some behind-the-scenes numbers on scoring patters in the league and let me tell you, alarm bells would be ringing at AFL House if they genuinely cared about these things. That’s the average end-of-season ladder position of the team sitting second on the ladder after three rounds of football since the turn of the century. Who is there right now? The Brisbane Lions, of course. The Lions appear to have righted their home ground wrongs to start the year, with a dominant win over the West Coast Eagles and a stirring fourth quarter comeback in what’ll end up being one of the games of the year on the weekend. In between, they beat North Melbourne after being five goals down half way through the third quarter. While that’s all well and good, putting up wins early in the season isn’t a guarantee of a finals spot. In that 19-season sample, a team has finished 15th (Collingwood, 2000), tenth (Adelaide, 2012), and 15th again (Gold Coast, 2016). However that is three of 19 seasons, and if you were to abstract those three seasons, the average finishing position of the team second on the ladder through three games is 3.3. So there’s that. Those are the picks Port Adelaide took inside the first round of the 2018 AFL draft. With those picks Port Adelaide selected Connor Rozee, Zak Butters and Xavier Duursma. Each of them have made quite astonishing starts to their AFL careers, with great poise and decision making complementing silky skills and a clear feel for the game. I am going very early here but I have loved Rozee ever since I saw him play for the Power in the preseason. His natural position isn’t clear right now, but his kicking five goals against the Brisbane Lions over the weekend suggests he may be suited to the tricky half forward spot. Butters and Duursma have looked great too, with the former already a favourite of Footy Twitter given his hair matches the South Park character he shares a name with. Port is an early season surprise packet, and the play of their youngsters is one of the reasons why. An aggressive mindset and attacking back line is the other. It might not hold for the full year, but it’s a heap of fun right now. That’s the number of marks Collingwood took against Richmond in their Round 2 win (it was the fifth most marks ever taken in a game). The Pies took 98 and 115 in their Round 1 and 3 losses to Geelong and West Coast, respectively. Their average number of marks through three games is 129, which is up from 92.8 per game last year. Even subtracting that absurd outlier from Round 2, it’s clear through three weeks Nathan Buckley has his players playing a different game to last season. Is that good? I’m not convinced it is. 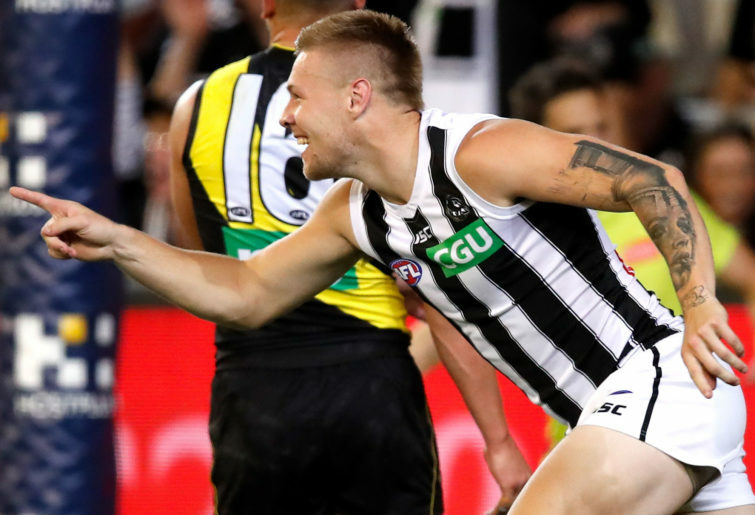 The Pies made it to the Grand Final last year, and bolstered their personnel group against the back half of 2018 via players coming back from injury and a couple of critical acquisitions. Last year’s Pies killed with pressure and a rabid intent to move the ball forward. This year, they’re playing at a much slower pace. Counter: the Pies might’ve lost to the two best teams in the league, and beat a presumptive top four finisher. It’s early, but the Pies’ thirst for marking the ball is one to watch. That’s how many games Richmond has played with at least one of Trent Cotchin, Jack Riewoldt, Alex Rance or Dustin Martin in their line up. If we include the now-departed Brett Deledio, that streak extends a further seven games to Round 17 2007. It isn’t quite time to panic at Punt Road. However, as we discussed in the preseason, the footy gods have a way of calling in their injury luck debts all at once. So it has been for the Tigers. What’s more, two of the three key injuries afflicting the Cotchin, Riewoldt, Rance and Martin quarter are contact injuries (Rance’s knee and Riewoldt’s wrist). Injury luck: it’s a thing. Note: this stat first came from football statistician extraordinaire @sirswampthing. It had to rip it because it’s incredible. The first number is the number of contact below the knees free kicks paid this year, in totality. That is, there has been less than one contact below the knees free kick paid per game in 2019. The second number is the number of career-altering, and life-altering, lower leg injuries which have occurred as a result of forceful contact below the knees this year, in totality. Please keep this in mind as we are forced to endure yet another existential crisis about “the game”, this time about this very effective and mostly harmless rule, over the next few weeks, or months, or maybe even years.